We constantly emit pollutants into the atmosphere from a wide range of activities, including transport, industry, power generation and heating our homes. Secondary pollutants are formed in the atmosphere by chemical reactions involving the primary emitted species. Some pollutants, such as CO2, cause climate change and are known as greenhouse gases (GHGs), while others, e.g. NO2, act locally, are injurious to health and are air quality pollutants. Most emitting activities produce both greenhouse gases and air quality pollutants, so that limiting one type of pollutant could lead to decreases or even increases in the other type. For example, reducing SO2 emissions from power stations reduces slightly the efficiency of generation and so leads to the emission of more CO2 per kilowatt generated. At present there is little or no connection between the strategies and legislation we develop to limit climate change and to improve air quality. But the identification and promotion of win–win policies, those leading to synergistic emissions reductions, and the identification and, if appropriate, elimination of win–lose policies, have clear advantages. There is a further way in which climate change and air quality in the UK can interact. The weather conditions in the UK will alter as the climate changes. Hotter summers, especially if accompanied by stagnant air resulting from anticyclonic conditions, could increase the frequency of photochemical smog episodes. On the other hand it is predicted that winter time inversions, often accompanied by high concentrations of NO2 and particulate matter, will be less frequent. These issues were considered in a recent report by the Air Quality Expert Group that advises the Government and the Devolved Administrations on concentrations, sources and characteristics of air pollutants in the UK. This article is a selection from some of the more chemical aspects of that report. The surface of the earth is warmed by absorption of light from the sun; heat is lost by emission of infrared radiation, some of which is absorbed by greenhouse gases in the atmosphere. Increases in the concentrations of these gases, following the industrial revolution, has led to a slight rise in temperature that is predicted to increase further, by a few degrees Celsius, over the coming century. CO2 is the most prevalent and effective GHG, but CH4, N2O and chlorofluorocarbons are also important. Radiative forcing provides a measure of the effect of anthropogenically derived GHGs on radiation. Radiative forcing is defined as the change in the net radiation balance at the tropopause (the boundary between the troposphere and the stratosphere) caused by a particular human induced mechanism in the absence of any climate feedbacks. Figure 1 shows a bar chart of radiative forcings from the Third assessment report of the Intergovernmental Panel on Climate Change [IPCC (2001)]. It shows the contributions from the four GHGs listed in the previous paragraph for the year 2000, relative to 1750, i.e. before the Industrial Revolution. It demonstrates that the contribution from CO2 is indeed largest, but that the other GHGs also make a significant contribution. Water vapour absorbs IR radiation but is not included in Figure 1 because it rapidly equilibrates with the surface of the earth, especially over the oceans, so that its atmospheric concentration is determined largely by temperature rather than emissions strengths. However, it does provide an important positive climate change feedback. As the temperature rises, its atmospheric concentration will increase with a consequent increase in its IR absorption. OH reacts with VOCs, either by H abstraction or addition, which is followed by reaction of the product radical with O2 to form a peroxy radical, which in turn reacts with NO to form NO2. A sequence of reactions can then regenerate OH. A key step is the NO to NO2 conversion, because this forms O3: photolysis of NO2 leads to NO + O3P and the oxygen atoms then react via reaction (3). Thus, although the reaction sequence is initiated by ozone photolysis, its chain character ensures that there is net ozone production, provided there is sufficient NO to react with the peroxy radicals; at low NOx­, the peroxy radicals react with other peroxy radicals to terminate the chain. Under these conditions, the reaction sequence leads to net ozone consumption. These reactions are responsible for the formation of photochemical smog, of which ozone is a major constituent. The timescale of the process is determined by the timescale of the initial attack of OH on the VOC, which can take minutes to years, depending on the VOC. In consequence, photochemical smog formation is a regional phenomenon – the air is carried over large distances during the overall reaction time. The same sequence of reactions is also responsible for ozone formation on a global scale. Much of the atmosphere is relatively unpolluted and the most important reactant species on this scale are CH4 and CO and a key issue is the availability of NOx to ensure ozone formation. Sources in remote regions include lightning and soils but also transport of NOx from polluted regions. This process is effected through the formation of peroxyethanoyl nitrate (peroxyacetyl nitrate, PAN). PAN is formed by reaction with NO2 with the ethanoyl peroxy radical, formed, for example, following H abstraction by OH from ethanal. PAN is consumed mainly by decomposition [reaction (5)]. At the surface its lifetime is short (~1h), but if it is lofted into the troposphere, where T is lower, it lives for many days and can be transported into unpolluted regions. Descent to lower altitudes leads to decomposition and hence to NOx formation. This chemistry also affects the concentration and hence the radiative forcing of methane. CH4 is removed from the atmosphere by reaction with OH; its concentration is determined by the rate of emission from the earth’s surface, by both natural and anthropogenic sources, and its rate of reaction with OH. Thus changes in [OH] are reflected in the global average [CH4] and hence in its impact on global warming. [OH] reflects what is termed the oxidising capacity of the atmosphere which depends on the chemistry forming OH, e.g. reaction (4), and that removing it, e.g. reactions with VOCs. The story is complicated because of the chain nature of the reactions – OH is regenerated following reaction with a VOC, provided NOx is sufficiently high, but not too high otherwise OH reacts with NO2 to form nitric acid, a termination reaction. Clearly [OH] depends on emissions of VOCs and of NOx, another clear link between climate change and air quality chemistry. What will be the effect of increasing future temperatures on the global scale oxidation chemistry? This issue has been investigated by Stevenson et al. (2005) who used global models to investigate the effects of changes in both future emissions and temperature on a 30 year horizon. As noted above, increases in temperature lead to increases in water vapour which increases the rate of reaction (4) relative to that of reaction (2). In those regions of the atmosphere where NOx is low, so that the oxidative chain length is short, this change in rates leads to a decrease in ozone especially over the oceans. In forested regions, this change can be more than offset by the increasing temperatures leading to increases in emissions of hydrocarbons, and especially isoprene, from vegetation, promoting ozone formation, provided NOx is available. A further important effect of increasing T is to increase the rate of reaction (5) and hence reduce the lifetime of PAN and limit its ability to transport NOx into remote regions. The changes they found in [OH] and hence in the oxidising capacity of the atmosphere were complex and difficult to interpret. The most important regions for removal of CH4 by reaction with OH are near the surface in the tropics. The rate of reaction is highest there, because of the higher temperature coupled with greater photochemical activity. They found increases in surface OH in the tropical NH and decreases in the SH. Aerosols or particulate matter (PM) provide an even more complex issue, relating air quality and climate change. Particulate matter has deleterious effects on respiration but has also been implicated in cardiovascular disease. It is the smaller particles (< 2.5 mm in diameter) that have the greatest impact on health. Composition may be significant, but results are ambiguous. PM is emitted from road transport in the form of soot and also material deriving from wear – of brakes, tyres and the road surface. Other sources include quarrying, sea salt and desert dust. Secondary PM is formed from reactions occurring in the atmosphere, for example the oxidation of SO2 into sulphate or NOx into nitrate and by the oxidation of organic compounds. In cities such as London, the primary road emissions are an important, but not dominant source of PM – the secondary PM, which is produced on a regional scale by the oxidation chemistry discussed above for ozone formation, is also important. Aerosols also influence climate, but in a different way from GHGs. Soot, an important contributor to primary traffic emissions, absorbs incoming radiation and so leads to warming. Reflective aerosols, such as sulphate, reflect radiation and lead to cooling. Their effect, though, depends on where they are located. Over dark surfaces, such as the oceans, which have a low albedo (reflectivity) and absorb most of the incident radiation, their effect is large. Over snow, though, which has a high albedo, their effect is much reduced. In addition, aerosols play a role in cloud formation, and affect the properties of clouds; clouds play a major role in the radiative balance of the atmosphere. Figure 1 shows the different contributions aerosols make to radiative forcing. The indirect effect is that related to their role in cloud formation. The error bars in the Figure show that, in assessing the effects of anthropogenic emissions on radiation, aerosols provide the greatest uncertainty by far. The consensus is that the overall effect is negative (leads to cooling). The cooling effects of sulphate aerosols led to the proposal by Crutzen (2006), that we should promote the formation of sulphate aerosol by burning H2S in the stratosphere to reduce the effects of GHGs. Such an approach is a high risk strategy and presumes that we can assess fully the impacts of such an action – our understanding of the atmosphere is, however, not perfect. Crutzen himself stresses that it is a last ditch strategy and should not be a substitute for the more prudent approach of emissions reduction. The lifetimes of emitted species in the atmosphere affect their impact on climate change. This effect is usually incorporated into assessments via the global warming potential (GWP) which provides a measure of the relative potential impact of emissions of a particular substance upon global climate. GWPs are defined as the ratio of the time integrated radiative forcing from the instantaneous release of 1 kg of a trace substance relative to that for a reference gas, normally CO2. The timescale chosen is usually 100 years. The atmospheric lifetime of CO2 is ~150 years and so, once emitted, it persists much longer in the atmosphere than methane, which has a lifetime of ~12 years. Methane, though, is a more effective absorber of infrared radiation and has a GWP of 23. The GWP for CO2 by definition is 1. Aerosols have a lifetime that depends on their size but is typically only ~ 1 week. It is, therefore, difficult to calculate a meaningful GWP for them. A potential problem that has been identified, though, is that reducing the concentration of aerosols in the troposphere, in order to improve air quality, could lead to warming of ~1 °C (Brasseur and Roeckner, 2005), because of the reduction in the aerosol cooling effect. What effect will changes in climate have on air quality in the UK? Predictions are bound to be highly uncertain. Uncertainties in regional climate predictions are even greater than those for the global climate and it is difficult to predict future emission any further ahead than ~10 – 20 years. 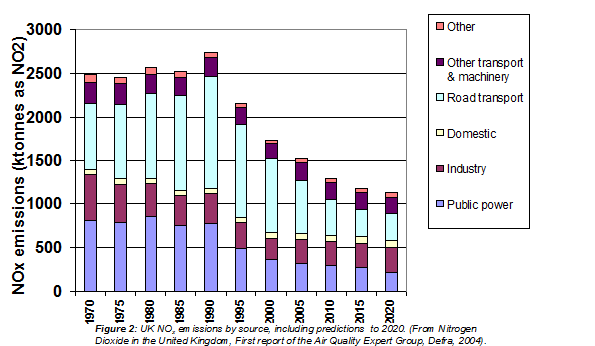 Figure 2 shows the decrease in NOx emissions in the UK since 1970. They show a sharp decrease in the 1990s, largely related to improved NOx reduction technology in power stations and the fitting of three-way catalysts to cars. A decrease is predicted to continue out to 2020, but no estimates are available beyond then. Future changes in both emissions legislation and technology can lead to significant changes in the slopes of emissions vs. time graphs. August 2003 gave a possible taste of likely effects, with present day emissions. The high temperatures and stagnant air led to a serious photochemical smog episode, with elevated concentrations of both ozone and PM. Excess deaths during this short period in the UK were ~ 2000, of which about one third were cause by poor air quality, the rest by the more direct effects of elevated temperature. Under the anticyclonic conditions experienced, the VOCs and NOx required for smog formation were transported from the continent, but there was an additional source of the elevated ozone. Vegetation emits isoprene which had a very short lifetime of only ~ 20 minutes under the conditions that applied and so travelled only short distances from its sources in the still air (wind speed ~ 1 m s-1). In the presence of the NOx transported from mainland Europe, the isoprene was a significant source of ozone in the afternoons. Vegetative emissions of isoprene depend strongly on temperature and the concentrations of isoprene were much higher than is normally experienced in the UK because the temperatures were unusually high (high 30s °C). It has been predicted, on the basis of climate models, that more than half of all European summers are likely to be warmer than that of 2003 by the 2040s. It has long been said that climate change is the greatest threat facing mankind. At long last, the political climate is changing and it is increasingly accepted that emissions leading to climate change should be controlled as soon as possible. Figure 1 demonstrates that it is not just CO2 that should concern us. There are significant effects of other GHGs, and aerosols too may present a major problem. The latter effects are difficult currently to quantify, but could lead to enhanced global warming as air quality is improved. It is likely that a wide range of approaches will be adopted to reduce CO2 emissions, though we will, no doubt, remain dependent on combustion technologies over the coming decades. It is important that we do not simply press on with CO2 reduction strategies without considering the wider implications for emissions of other GHGs, of aerosols and of the impact on air quality. The strong linkage between emissions responsible for air pollution and those implicated in climate change demands a closer alignment of air quality and climate change policies. This is not currently the case. One problem is that it is difficult to obtain the necessary information to make such an integrated environmental impact assessment. For example although it is generally accepted, on a g CO2 emitted / km travelled, that diesel vehicles are more fuel efficient than petrol vehicles, this assessment does not take into account, for example, energy consumption differences in the refinement process. A full fuel cycle analysis is needed to make a reliable comparison. Furthermore, it is difficult to combine assessments of CO2 impacts, with those of PM emissions on climate or of PM and NOx emissions on air quality. Further work is urgently required to allow more robust assessments upon which to base future policies. I am grateful to members of the Air Quality Expert Group on whose work much of this article is based and to Dr Robert Pilling for helpful discussions. Brasseur, G. P.; Roeckner, E. (2005). Impact of improved air quality on the future evolution of climate. Geophys. Res. Lett., 32 (23), L23704, doi:10.1029/2005GL023902. Crutzen, P. J. (2006). Albedo enhancement by stratospheric sulfur injections: A contribution to resolve a policy dilemma? Climatic Change, 77, 211-220. IPCC, 2001, Climate Change 2001, Third Assessment Report of the Intergovernmental Panel on Climate Change, Cambridge University Press, Cambridge, 2001. Stevenson, D.; Doherty, R.; Sanderson, M.; Johnson, C.; Collins, W.; Derwent, R. (2005). Impacts of climate change and variability on tropospheric ozone and its precursors. Faraday Discuss., 130, 41-57. Stott, P. A.; Stone, D. A.; Allen, M. R. (2004). Human contribution to the European heatwave of 2003. Nature, 432, 610-614: doi:10.1038/nature03089.